“None of those were there before,” he said, pointing to a half-dozen brown splotches in the ceiling. Díaz, a music teacher and member of the town council in the hard-hit municipality of Loiza, knew that many of his neighbors were still waiting for repairs. So he began teaching himself the basics of construction. César Díaz, a music teacher at the nonprofit Centro Esperanza and council member in the municipality of Loiza. The Federal Emergency Management Agency denied his application for help to fix his damaged roof. He later qualified under a federally funded program run by the island’s government, but says the contractors sent for the job made the problem worse. “Puerto Rico has always been in the path of hurricanes, and it always will be. So in my opinion, a good roof is a matter of life or death,” he said. “I want to be able to tell if the crews the government is sending to repair houses in my community are doing the work. Díaz is not alone in his scrutiny as Puerto Rico’s government ushers in the next phase of its reconstruction — a massive rebuilding effort funded by nearly $20 billion in grants from the federal Department of Housing and Urban Development. Island officials will have broad discretion to spend the money as they see fit — from repairing damaged homes and building new ones, to shoring up crumbled roads and infrastructure, to launching tourism and business development projects. But the pressure to spend the money wisely and efficiently is enormous, not least because President Trump himself has reportedly tried to hold up various sources of funding for the island after accusing its elected officials of being “inept politicians” likely to mismanage the funds. Many Puerto Ricans have denounced those attacks as unfair stereotypes. Even so, people on the island have their own concerns about the government’s plans for the money, given its poor response in the immediate aftermath of the hurricane, the lack of transparency in many agencies, and the persistent perception that cronyism rules when it comes to government contracting. The island’s governor, Ricardo Rosselló, seems well aware of these concerns, and said he’s gone so far as to ask officials at HUD to hold his government accountable for its spending. 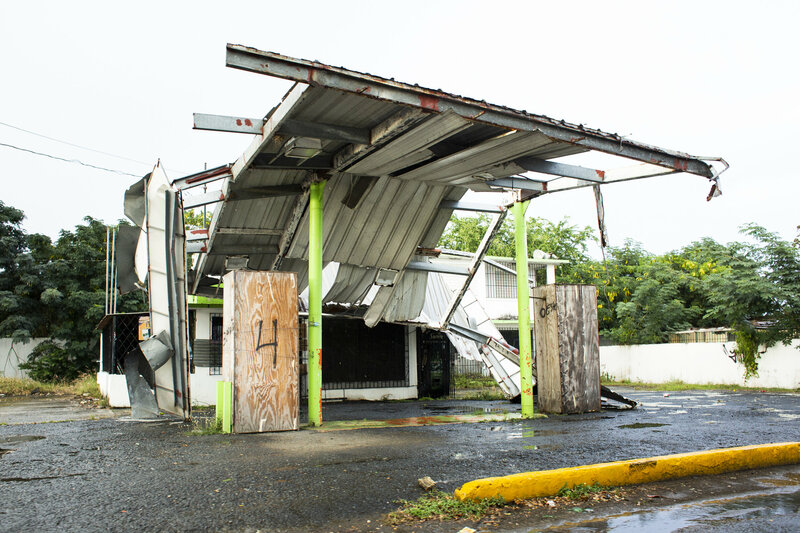 A gas station remains damaged in Loiza. Officials on the island see the $20 billion HUD allocation as an historic opportunity to fund public projects that the bankrupt territory could never otherwise afford. Massive budget cuts and austerity measures imposed by a federal oversight board working to dig the island out of $73 billion of debt have sliced deeply into the government’s ability to provide basic services. So the HUD grants are a rare bright spot. Over the last year, the government has developed a series of broad spending plans that are in various stages of approval by the federal agency. And though disbursements were held up by the federal government shutdown, officials expect the first several hundred million dollars to begin flowing imminently. But on an island where damage from Hurricane Maria is still visible on nearly every city block and around every bend in Puerto Rico’s many winding rural roads, some on the island are questioning whether the government is fully prepared to get the money where it needs to go. They worry that in the rush to get the money flowing, many communities may be overlooked. Ariadna Godreau-Aubert, executive director of the nonprofit Ayuda Legal Puerto Rico, is pressuring the local government to make good use of the billions in federal grants destined for the island. The island’s government has rushed through public comment periods and not made a meaningful public outreach effort, Godreau-Aubert said. The process for proposing projects for funding is highly technical and can require large lines of credit often accessible to developers but not to groups working in local communities. And the government has only posted contract bidding documents in English on an island where just 20 percent of residents report speaking the language well. When people are not part of the process, they become displaced by the process. “What happens is that when people are not part of the process, they become displaced by the process,” Godreau-Aubert said. Officials will use a significant chunk of the first $1.5 billion that HUD has approved to relocate families whose homes are in flood-prone or other risky areas. To advocates like Godreau-Aubert and others, that sounds like tearing communities apart. Asked about these concerns, Gov. Rosselló said they were overblown. 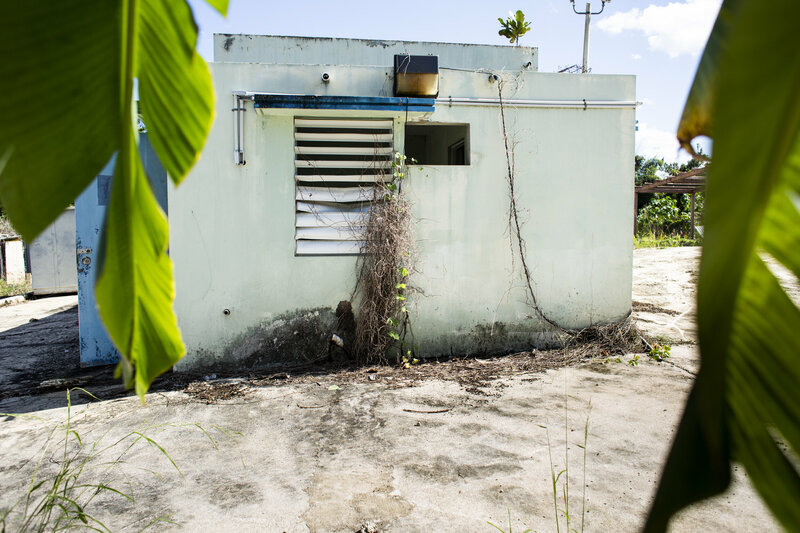 A long-abandoned water filtration plant in Camuy. Now that it appears money from HUD may arrive before some FEMA funds, Mayor Edwin García Feliciano’s staff has been working feverishly to complete the list of projects he wants the island’s government to approve for funding. “I’m telling you this from the bottom of my heart. We want this plan of reconstruction not to be the governor’s plan or the mayors’ plan. It needs to be the plan of all Puerto Ricans,” Rosselló said. Public outreach is a HUD requirement, and the governor said his government has taken it seriously. “But make no mistake about it, we’re moving fast, but we’re moving transparently and collaboratively so we can have the best long-term reconstruction of Puerto Rico,” the governor said. We want this plan of reconstruction not to be the governor’s plan or the mayors’ plan. It needs to be the plan of all Puerto Ricans. Still, the calls on the governor to slow things down and engage more broadly with the island’s civil society are growing. In large part that’s because, like the governor, others view the avalanche of federal funds as Puerto Rico’s one shot to make a meaningful dent in some of the island’s most entrenched social problems, especially housing. On Thursday, researchers at The Center for a New Economy, a respected San Juan think tank, warned that while the government’s spending plans for the HUD grants do a good job of identifying many of the problems facing Puerto Rico’s housing stock – like informality, the lack of affordability, and widespread damage from the storm – the plans do not outline a nuanced or comprehensive path forward. An long-abandoned water filtration plant and a tree with an attached sign labeling it as dangerous. Though dead, the tree stands precariously beside utility cables and a house in Camuy. “What you see is that the government has a menu of proposals, but it’s not clear how they’re interconnected,” said Raúl Santiago-Bartolomei, the center’s expert on federal recovery funding on the island. Starting next month, the center will launch a series of conferences aimed at bringing longtime social advocates, researchers and planners together with government officials. 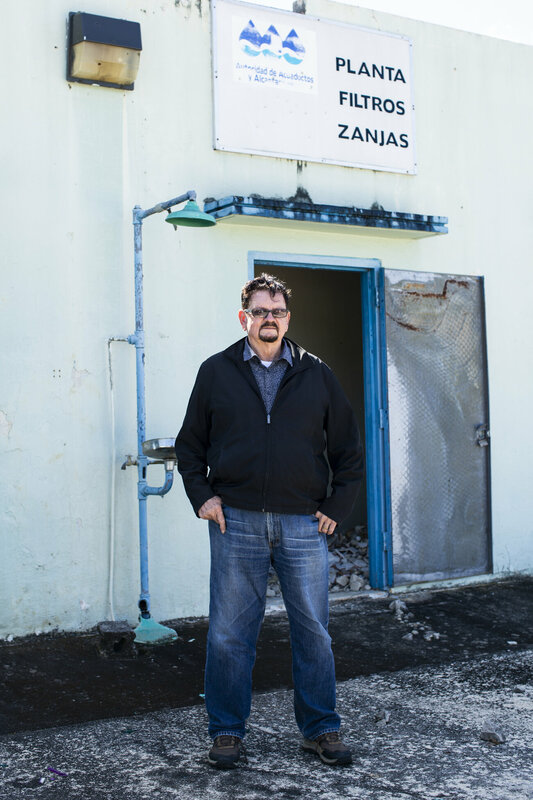 Deepak Lamba-Nieves, the center’s research director, said doing so is necessary in part because budget cuts have gutted some of the government agencies that might otherwise be equipped to thoughtfully plan the island’s reconstruction. It is a gargantuan challenge given the often competing pressures on the central government from the island’s 78 mayors, private developers, and large nonprofits — all wanting their share of the federal windfall. Edwin García Feliciano, mayor of the northwestern town of Camuy, is frustrated by how long it’s taken FEMA to fund important repairs in his community. In the northwestern municipality of Camuy, Mayor Edwin García Feliciano said that after the hurricane, he was frustrated by how long it took FEMA to fund important repairs in his community. In some cases, he is still waiting. Now that it appears money from HUD may arrive first, his staff has been working feverishly to come up with the list of projects he intends to submit to the island’s central government for funding: roof repairs for hundreds of families in his city still living under blue tarps, new pumping facilities that would provide more reliable running water, and road improvements, among others. “I’ve been mayor for more than 16 years, and I’ve never had this kind of opportunity to improve Camuy,” García said. He and other mayors, including Carmen Yulín Cruz, of San Juan, are also arguing for greater flexibility in how they spend HUD funds in their own communities, arguing that’ll make the recovery more nimble. 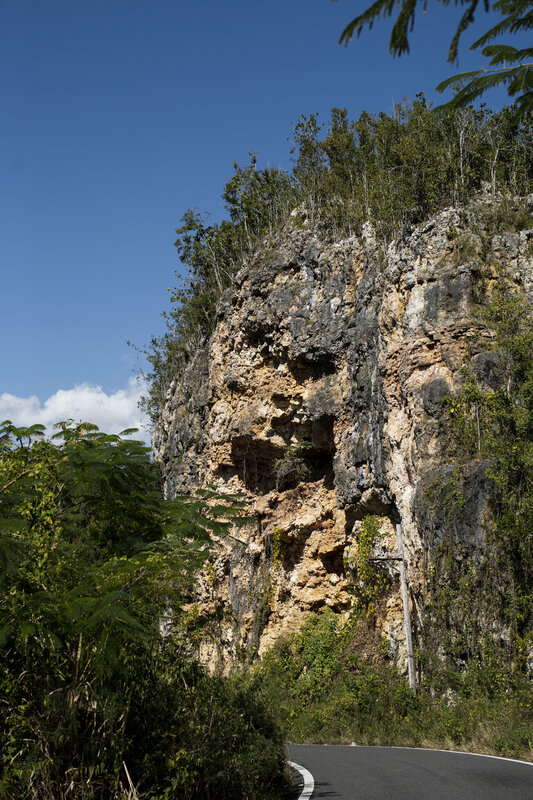 A roadside rockface near the home of Porfidio Román in Camuy. He says it should be demolished to prevent the rockslides frequently triggered by rain. But García said the central government may do a city-by-city assessment before deciding whether to grant such flexibility. In some towns, he said, there are concerns about fiscal health, staffing levels, and corruption. While mayors are likely to be the principal conduit for federal money into communities, they aren’t the only ones drawing up their lists of projects. When Porfidio Román learned close to a year ago that the island’s housing department was hosting a public hearing to take suggestions on how it should spend the billions in federal grants, he drew up his own list. Porfidio Román is a former council member in the municipality of Camuy. He submitted a list of repair projects that he wants the island’s central government to fund in his community. A water filtration plant that has been closed for years is one he thinks would help the neighboring barrios if reopened. 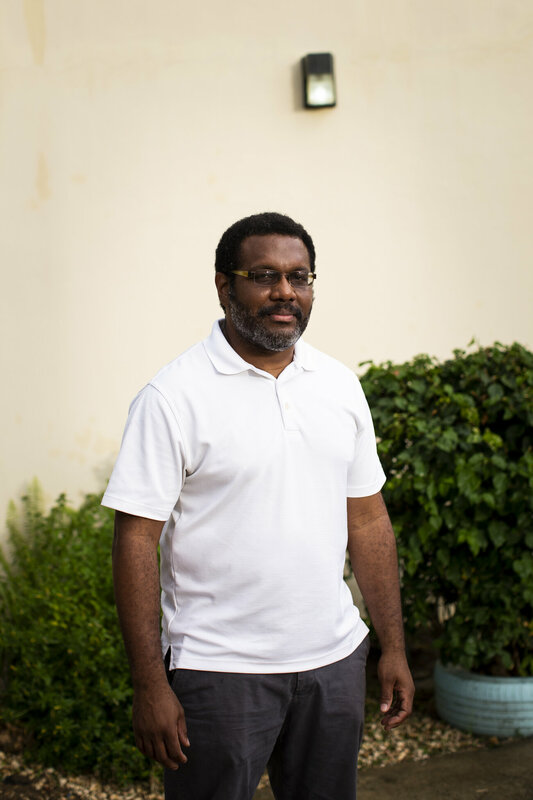 Román served on the Camuy city council more than a decade ago, and is now a private citizen. He still walks the neighborhoods frequently and knows many of Camuy’s problems, down to the spots where the sidewalk ends. He has politicking in his blood, and said he has designs on running for mayor when García retires. 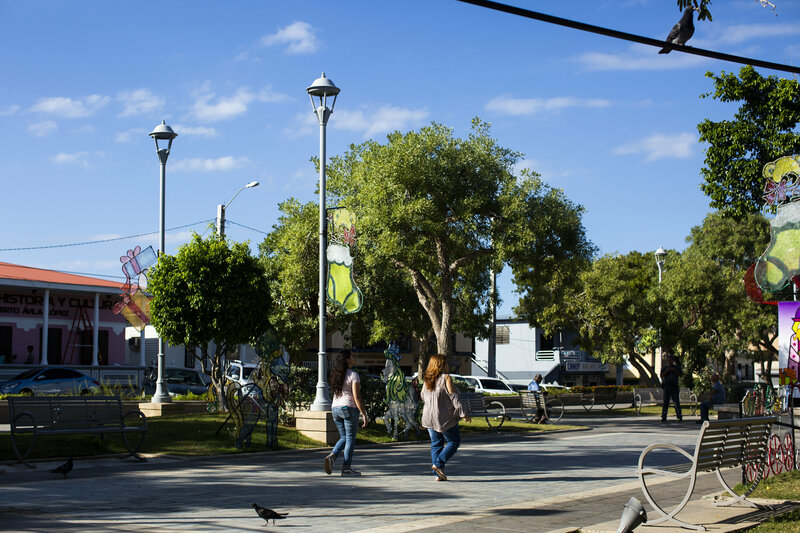 On a recent morning, Román drove his bright orange pickup truck along Camuy’s winding mountain roads and pointed to several of the projects he’d included on the list he submitted at the public hearing. There was the stretch of road where he said a few more utility posts would connect an adjacent neighborhood to a more reliable section of the electric grid than the one that currently powers it. There was a long-abandoned water filtration plant that, if reopened, he said, could provide more consistent running water to two nearby barrios. Then he stopped at a small sports arena. Hurricane Maria had smashed in the roof, and more than a year later, it was still a mangle of metal. Román has no idea whether any of the billions in federal grants will find their way to the projects he’s proposed. 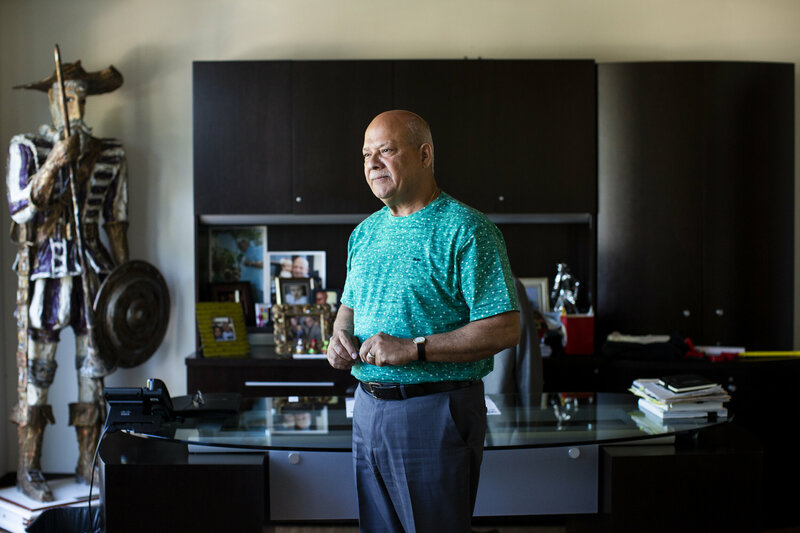 What he knows, he said, is that the answer will say a lot about how serious Puerto Rico’s politicians are about ensuring the money for the island’s reconstruction gets to the places that need it most.